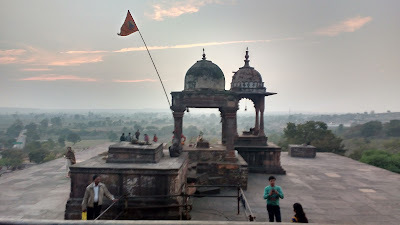 The founding of the city of Bhopal is attributed to the Parmara king Bhoj. 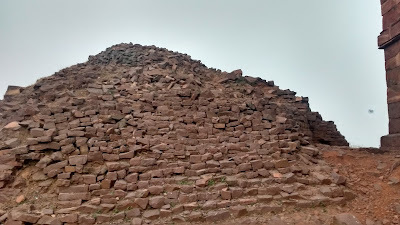 The king also founded another place, about 50km South-East of Bhopal on the banks of the river Betwa - Bhojpur. 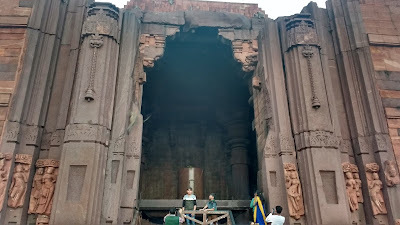 Bhojpur never really took-off, much like the monument around which it was based - the temple of Bhojeshwar. The temple in question is simply massive and lies incomplete to this day. It houses India's largest shiv-ling at more than 2m. 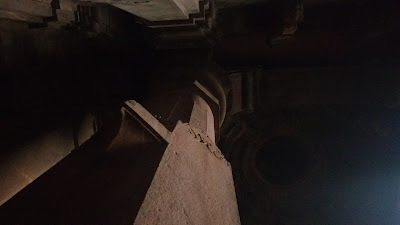 The construction of the massive temple dates to the early 11th century and is attributed to King Bhoj. 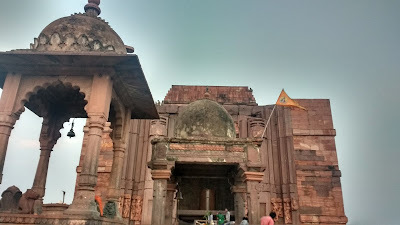 The temple faces west and has a cuboid plan. 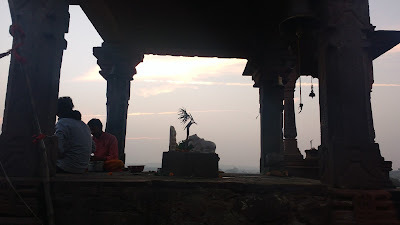 The main sanctum occupies the whole of the temple and houses the huge shiv-ling and its base platform. All offerings are set at this platform only, while access to the shiv-ling is restricted to the priests. The sanctum is open (does not have a door), but access is restricted by means of human-sized gates. The walls of the sanctum measure a massive 20m on the outside, and about 13m on the inside. 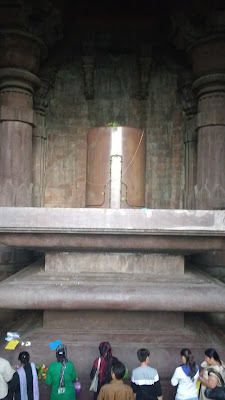 The main shiv-ling in itself has a height of 2.3m and circumference of 5.4m. 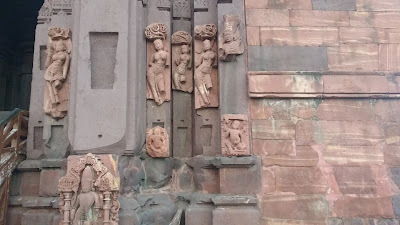 The sanctum facade features some divine images (apsaras and ganas for most part). The external walls are plain but feature faux balconies on the three walls. A magar (crocodile) serves as an outlet for the shiv-ling. There are two smaller shrines in front of the sanctum. These belong to a sarpa (serpent) and a small shiv-ling. The construction of the original temple was left incomplete due to some reason - war, calamities or structural issues are possibilities. A ramp located to the north-east gives an indication to the original construction efforts. 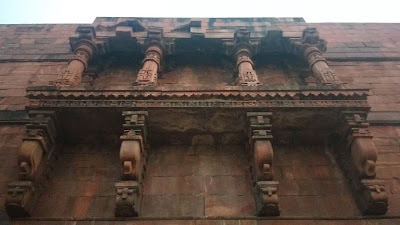 The temple was structurally weak during the post independence era when conservation was first initiated. Major work was carried out in 2006-07 under the leadership of K. K. Mohammad of the ASI. The ASI has repaired the facade, added a missing stone coloumn and set a fibre-glass ceiling to complete the structure. 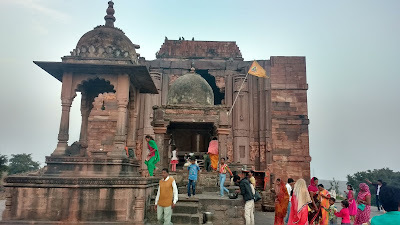 Bhojpur is best approached from Bhopal. The Bhopal city buses plying to the industrial area of Mandideep halt at a stop called 'Gyarah Meel' (11miles). Local rickshaws ply from here to Bhojpur for Rs20 per seat. There are direct buses from Bhopal too. 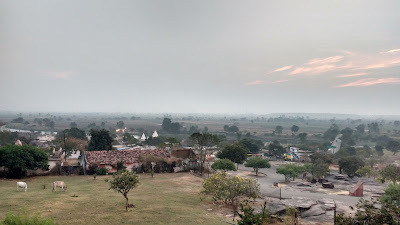 The last one leaves Bhojpur at 6pm. 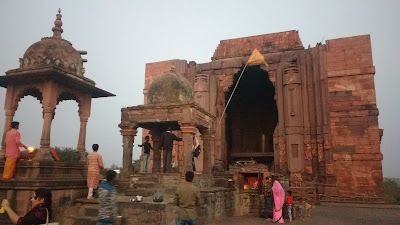 Time is critical for visiting Bhojpur, since there is hardly any transport available after sunset (or temple closing time) and you would be at the mercy of a handful of vehicles that ply the route.